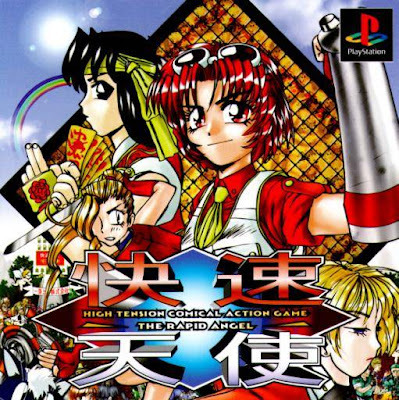 I bought Rapid Angel on the Japanese PSN a long while ago, intending to do an HG101 write-up, but never put much time into it. After seeing THIS entry on Siliconera though, announcing its imminent release on PSN Imports by MonkeyPaw Games, I thought it time to finally play through. 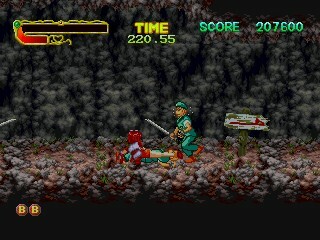 I’d first heard about Rapid Angel on obscure games website Twin Dreams (which is where I’ve borrowed all but one of these images from), which is/was kind of like a proto-HG101, covering obscure Japanese games. Sadly it stopped being updated years ago. 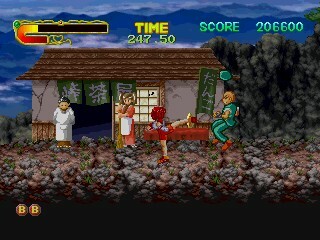 When Rapid Angel came out on PSN I didn’t recognise the kanji name at first, and the 3 screenshots shown in the preview made me think of Guardian Heroes, sort of. 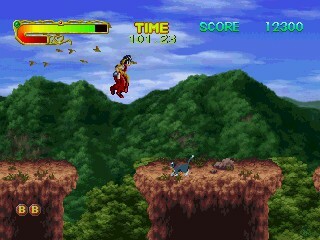 Well, it’s nothing like Guardian Heroes (for that you’ll want Panzer Bandit on PS1), but it is pretty awesome. 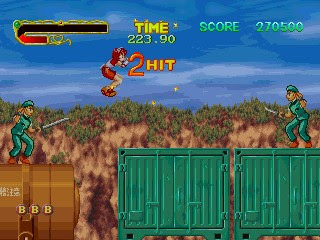 I seem to be playing a lot of 2D games recently, including Little Ralph and Hermie Hopperhead (planning a proper feature on this for HG101). And I have mixed views on all three of these. Hermie is undoubtedly the prettiest, with Ralph somewhere in the middle and Rapid Angel coming across as quaintly quirky in the visuals department (though it does have some cool scaling effects). Hermie though is proving too samey and awkward to really enjoy playing; it’s OK, but maintaining three hatched eggs is more work than fun sometimes. Ralph I think is overrated, too obsessed with speedrunning its brutally difficult stages – and I absolutely hate speedrunning. Rapid Angel meanwhile, despite or because of its rough around the edges nature, has proven quite charming. RA actually reminds me El Viento, in fact it reminds me of a lot of various Telenet games. And the thing is, I love Telenet/Wolfteam/RiOT – that whole messy web of subsidiaries and divisions. None of their games were masterpieces, but they had a kind of dirty charm peculiar to a very specific era in gaming history. There’s a classification of games which doesn’t really have a word (and it’s not kusoge), which I equate to eating a grubby hotdog from a street vendor with all the toppings. You know it’s not top quality food, but damn if it doesn’t somehow manage to taste really good. These are Telenet games. This is Rapid Angel. But I can’t emphasise enough, this is not a criticism. 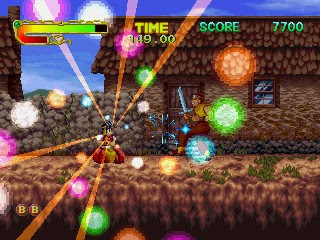 These types of games, with less polish than others, satisfy a very specific kind of appetite in retro gamers. And I would say they’re fantastic, for what they are at the prices they are, but not for the criteria a commercial magazine would judge them by. Shelled out the 600 yen from my Japanese PSN "wallet" to download an intriguing-looking old PlayStation game I never heard of before, called Kaisoku Tenshi, or "The Rapid Angel" (actual official English title, according to the game's title screen)... and to my surprise, it's actually quite good! 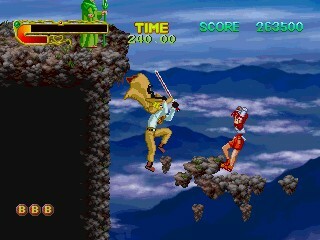 It's a heavily arcade-influenced beat-em-up platformer, kind of along the lines of something like Battletoads. It doesn't really offer anything new over other games of either the beat-em-up or platformer genre, but it has a lot of variety, a lot of story, and short fun levels with lots of checkpoints. The coolest thing about this game is that you get a choice of 3 different characters to play as from the start (all of whom have very different attacks), and for each one, the story seems to unfold a lot differently. And as you play, you get an occasional choice to make, which influences the story to come, and also unlocks various other playable characters - including villains - for future story-mode playthroughs. The downsides to the game are that its character art looks really amateurish (though it's not without its charms! ), and its music is COMPLETELY forgettable. 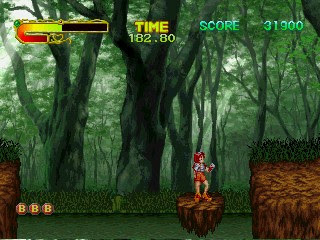 But the in-game sprite graphics are pretty detailed, the backgrounds are drawn in a well-put-together combination of 2D and fairly nice 3D (for 1998 especially! 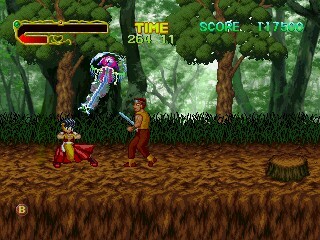 ), the pacing is fast, the controls are a little sticky but overall pretty good (they feel more like beat-em-up controls than platformer controls, but anyone who's played beat-em-ups before shouldn't have any trouble getting used to them), and there's also a lot of crazy humor and over-the-top action, presented very well. What intrigues me most is that MonkeyPaw are releasing it with the Japanese dialogue choices. I lent my camera to someone for the week so can’t take pics of my PS3, but I did take a photo when I first downloaded it, of one of the dialogue choices (pictured). They’re not game breaking, rather they alter things slightly as Wyrdwad mentioned. I guess this gives a good reason for replays (especially since there are several characters to unlock), and kinda harks back to the old days, when you’d import and have to work your way through a game with broken Japanese, or none at all, which in itself is kind of interesting. They do always provide translated manuals on their website though, which is neat. Rapid Angel is an extremely obscure title, and also totally awesome if you're the kind of person who enjoyed Telenet's offerings back in the day. Well worth investigating if you’ve not already bought it off the Japanese PSN. Since posting this MPG has released a press release, which also talks about a meat-based puzzler. I've not tried it, but thought it worth reprinting here. There have been many food simulation games over the years. Something about balancing the art of cooking while pleasing your patrons fits video games well. The act has that compelling tension that fosters strategy and quick reaction. So with an extended drumroll we bring you a foodie game of Japanese cuisine and eating etiquette. Yakiniku Bugyou is a restaurant simulation based on that favorite food, red meat. Yakiniku are thin slices of a various meats barbequed over flaming charcoal. Like our upcoming summer project BurgerTime World Tour, this food extravaganza will get you hungry just playing! The frenetic puzzler requires being an extra careful, fast and efficient chef. Just don't overcook the meat and watch your customers for a satisfying result. Added to my must play list thanks! Guess what's on J-PSN now? Hell's yes! Grabbed it just now, along with Hustle Kings - I had every other PS3 title already. 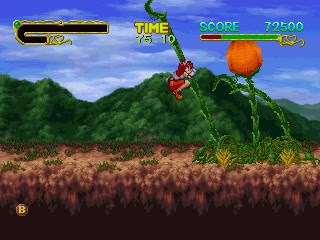 Ys IV on PC-Engine is also up, which I'm tempted to get as it's my favourite in the series. But at 800 Yen, and with it already on my Xbox, I'm not sure I can justify it. great to see Panzer Pandit on their. Plus Klonoa. And maybe Tombi if you liked it (I didn't). 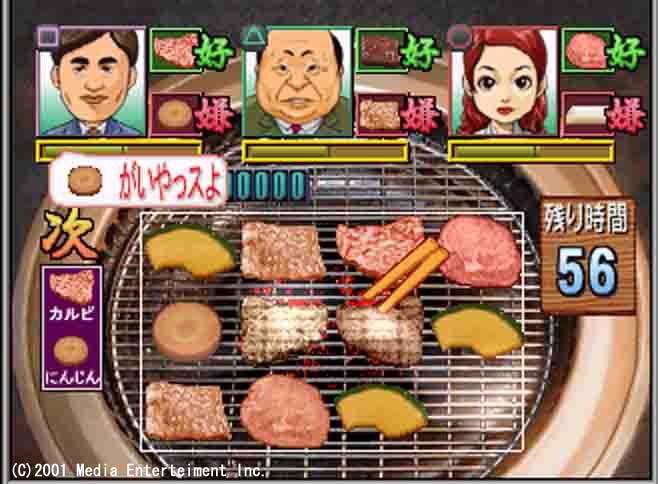 Yakiniku Bugyou was mentioned in an episode of GameDiggin, which reduces its obscurity slightly (at least for Japanese gamers); from the episode in question, there sure seem to have been a lot of food-related action puzzlers on the PS1 in Japan. also great to see little ralph mentioned. probably my favorite psx game, alongside FLUID and INTERNAL SECTION.